Yes I have pets!! I am the proud owner of 3 beautiful, loving Sphynx, Osiris, Ra and Lily Bastet who is pictured with me. I have been married since 2005 to an amazing man who is literally the wind beneath my wings. We also have a teenage son. I am originally from Kingman, AZ growing up in a trailer home with no heat and no hot water, alongside railroad tracks parallel to the famous Route 66. Today this is not how I expected my life to end up, to be an author of a book. I didn’t expect to live through my childhood and I am not supposed to be here after having a code blue called on me last year as you will read in the book. So I am thrilled to be alive and here, to be able to be a part of a project to encourage and inspire the world which has been my personal mission throughout the years. I have had many life difficulties and risen as as Phoenix several times as will be eventually addressed in my autobiography but this chapter “Phoenix Defying” is just a glimpse into my most recent rising. As for the rest of my personal life I am also an advocate for several causes that have touched me personally including child abuse, domestic violence, adrenal Insufficiency (a rare daily life threatening condition) as mentioned in the book, foster care, and chronic daily pain. My life’s mission is to touch others lives through various avenues including beauty pageants, volunteering and speaking at events. I am currently the 2018/2019 International Ambassador for Ultimate Elite Pageants. 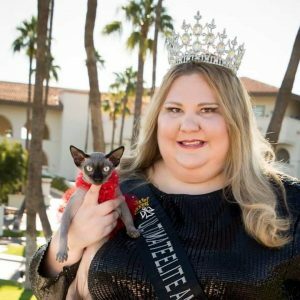 I compete in pageants to show pageants are more than just looking for a pretty face, we are about serving the community and advocating for important causes. My playform is “Defying the Odds” and I’m proud to share it with the world and hopefully give at least one person a glimmer of hope and encourage them to Defy their Odds. I literally rose again from the ashes and was given another lease on life. I HAVE to live life to the fullest and take every opportunity that comes my way. I want to leave a legacy of inspiration and community service showing you can Defy Your Odds and I feel this book is just the start. I have to give credit to my mother. She started me reading at a very early age with hooked on phonics. She built a whole wall library of books in our home and I literally read everyone of them from cover to cover. Not to mention trips to the library every several days. The books I read from age 2-12 were deep books. They were history books, religious books and Bibles and every type of educational book possible. Story books were put to the back of the pile however. I learned to speed read very quickly. After every book, to make sure I read and mentally processed the book, I had to write a multiple page book report. That amounted to quite a few book reports over a decade, but I enjoyed it. It was an escape from the daily abuse I experienced. It was my safe haven. Highschool I continued to write and my freshmen year I entered a National poetry contest and placed in the Top ten and had my poem published in the book. I wish I could remember the name. Throughout high school I entered several poetry and essay contests and won or placed. I was told one day I would write a book. I of course didn’t think that I was capable of such an awesome opportunity. And now I have not only this book but several others in the near future planned. My all time favorite author is V.C. Andrews. I fell in love with her works in highschool as I could relate to some of her characters and their experiences and emotions. I also love Danielle Steele, Nora Roberts, John Grisham and Michael Crichton. I prefer fiction but will read anything involving cats or the Egyptian culture. There is no one person who inspires my writing. I have to say that life in general, circumstances, events are what inspires me and I only get inspired occasionally. At those times I have to drop everything and start writing or it slips from my grasp. I do think I naturally have a creative writing gene in my DNA if that is possible as mother wrote songs and poems and so did my father. My latest book is my first book and is a collaboration with many other authors with amazing stories of thriving through life’s difficulties. I participated in this project as it aligns with my personal cause of encouraging the world to Defy Their Odds by being and example of “Defying the Odds” myself with everything I have been through, most recently the code blue and my rising as told in the book.